The participatory performance Ancestors retraces the adventures that have succeeded in uniting our ancestors from their various regions or countries of origin. Mixing everyday scenes and adventures, the narrative relies on articulated figurines, sculpted by the participants. Having features of dolls, puppets and statuettes, they tell of exile, resistance, love and most especially give life to the mysterious and invisible link that each of us has with our ancestors. which is no less reliable than memory”. For twelve years, Les Grandes Personnes has been very specifically interested in the relationships between generations. The team includes three generations of creators and fabricators, joining children and elders in the projects and the workshops. 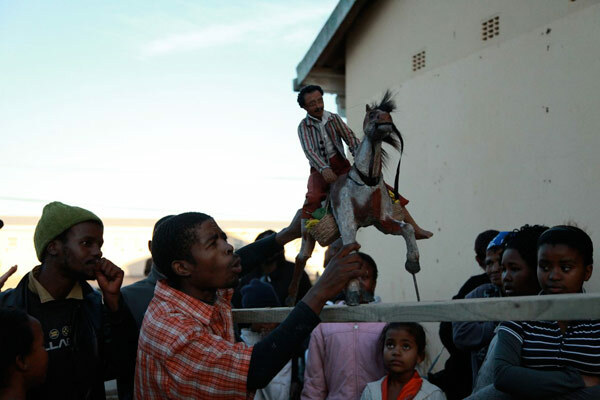 The performances Une Grande Famille played in Burkina Faso or the Giant Match in South Africa are suitable for several generations of giant puppets in urban spaces. By a Thread, and its sculptures that are passed from hand to hand, deals with family transmission. And these very visual creations are intended for all ages. 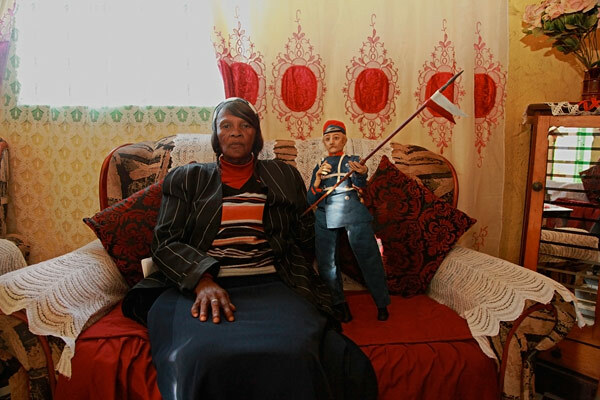 Recently, the work in South Africa and in Aubervilliers has sparked a reflection, within the collective, about the issue of conflicting memories. Ancestors is a participatory project, a collective creation that aims to encourage a group of diverse individuals to reflect together about their origins and history. Ancestors ties together individual and collective destiny, reintroducing the individual into history. _It is not a question of pretending that past conflicts no longer matter, but on the contrary, to calmly address opposing memories, to develop not memorial rivalries, but a plural narrative where the memory of conflicts can be expressed, and be resolved through art. So working together with Les Grandes Personnes are descendants of African warriors who faced colonisers and great-grandchildren of soldiers who besieged their villages, while in France grandchildren of FLN insurgents live next to grandchildren of French conscripts who fought them so fiercely. This project is mainly aimed at individuals interested in the question of their origins and by the history of generations that preceded them. It will take on its full scope in regions where the history of settlements is complex, whether colonial, post-colonial or migratory. It will speak of populations which, not recognising themselves in the way books tell their history, would like to reclaim it, imagine it, or reinvent it. We can invent ancestors, like we sometimes invent a family. The entanglement of journeys, conquests, exiles, uprooting, taking root, languages, traditions and forgetfulness that weaves the history of a single neighbourhood certainly provides enough material to recount and to create. Older people, who often like to look back on their history or their genealogy, have important building blocks to bring to this construction. While experienced writers, historians, artists and technicians will support the creation, the more varied the group is in its origins, the more interesting the construction promises to be. The performance is intended to be created during residencies of about fifteen days. Participants, of different origins, genders and professions work together in a quiet setting, conducive to encounters and to creation, which can accommodate the group and the workshops. Participants are invited to personify one of their ancestors through a writing workshop, conducted by a writer, a visual artist, and an historian among others. This ancestor can be imaginary or real, probably both at the same time. From the origins of mankind up until today, a long chronology is concretely established in space. Within this chronology, each participant chooses the era and the generation in which they want to set their ancestor. They invent ties, a true filiation or a relation, that links them to the previous and following statuette. Each ancestor embodies an era and a generation, each ancestor is linked to the one that precedes it and follows it. Thanks to a sculpture workshop conducted by several visual artists, sculptors and costumiers, each participant brings an imaginary ancestor back to life, in the form of a statuette with a mechanism. Possible artistic expressions are multiple, but rules are established for techniques and scales. making the plan, design, model, what attitude, what gesture, what action, what mechanism? During performances, participants present and manipulate the statuettes of the ancestors, either alone or with others. Each person chooses the language in which they will present their ancestor, their stories are subtitled in two other languages. The group works with the help of an author and a director to build a simple, lively and polyglot performance. The viewer can thus travel back in time through the intersecting tales of the “ancestors”; the succession of these characters gradually portray the common destiny of a population. The performances are filmed, the stages of the creation and the finished sculptures are photographed. After the performances, “Ancestors” lives on as an exhibition that can travel, being easy to pack and not too bulky. The exhibition presents the statuettes and related texts, a video of the performance, photographs of the stages of the creation and of the participants. A website allows visitors to travel intuitively within this imaginary “genealogy”, to go back centuries with a click of the mouse, to stop on this or that ancestor, to operate the mechanism virtually. The project is intended to give birth to several residencies and “genealogies”, in various countries. The work, the site and the exhibition will thus be gradually enriched by new contributions, by new “elders”, by new ancestors. The creation will bring together an international team and translators. It will be carried out in several languages, each person being free to imagine and recount in the language of their choice. The performance will be offered in several languages; luminous caption stands will will make it possible to subtitle performances in two other languages so that they can be presented simultaneously in three languages and be accessible to the greatest number. In the title of the project, the word ancestors could lead to a certain confusion. With the greatest respect for customs and various religious practices, we will be careful to avoid any confusion between our work on the elders and an imaginary genealogy and traditional ancestor worship.